I meant channels 27* and 24. 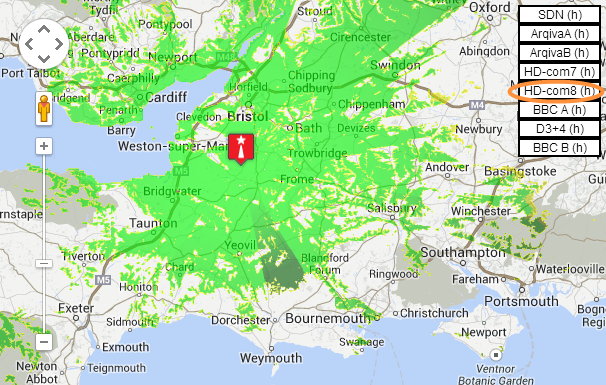 I live in the BN41 area of Brighton & Hove with my aerial currently pointing at the Whitehawk transmitter. I currently also get (I think) a good signal from the Rowridge transmitter through the back of the same aerial even though it is (obviously) pointing the wrong way. Does this mean that I may be able to get the new HD services from Rowridge (when they start) without doing any aerial upgrades? I want to keep my local services from Whitehawk to stay on the BBC South East region, and to get local TV when it begins. I suppose the other option would be to add a second aerial pointing to Rowridge and use some form of combiner? Peter: If you can get the services from Rowridge from the back of your aerial - which is quite common - the you will probably be able to get the new HD services. I'm not so sure about having a second aerial - without special filtering you are very likely to introduce "ghost" signal from Whitehawk from the "back" of an aerial pointing directly at Rowridge. Will Brierley hill or the Wrekin transmitter ever transmit all bbc hd channels and if so when. Sorry, if it has already been asked elsewhere, but do you know if there are plans for those transmitters not carrying COM7 to do so? I am currently on the Nottingham transmitter but according to the maps I would be on the very edge of Waltham transmitter coverage. Neil Richardson: That's not likely. Waltham's COM7 is on much lower power than the rest, so if you're using Nottingham transmitter because Waltham's main channels aren't really good enough then it's COM7 will be no good to you. I've just switched back from Freesat and am on the Swansea Kilvey transmitter. It looks like bbc news hd is not currently being transmitted? Does anyone know if this is scheduled to come online at some point? Paul: Kilvey Hill does not have the COM7 mux which carries BBC 4 HD & BBC News HD. Coverage of COM7 and COM8 will not be expanded as these are temporary multiplexes which will close in 2020. As long as you still have the box and cabling in place there is no reason you can't use both Freeview and Freesat together with the same TV. Thanks Steve. What happens in 2020? Or is that all still up in the air? Spectrum sell off maybe? Paul: The 700MHz band will be auctioned off in 2020 which will require the frequencies currently used for COM7 and COM8 to be reused for other muxes. Starting next year there will be frequency changes on most transmitters as all the muxes are reorganised for the 700MHz clearance, which will result in some households needing new aerials (see the article on the ukfree.tv homepage). By the time COM7 and COM8 close it is expected that the remaining PSB and COM multiplexes will have switched to DVB-T2 transmission as already used by PSB3, COM7 & COM8 which will make up for the capacity lost by COM7 & COM8 closing and provide much more capacity in areas where COM7 & COM8 aren't available. One of the reasons COM7 and COM8 were created was to increase take up of DVB-T2 capable equipment so that people are ready for a future switchover.